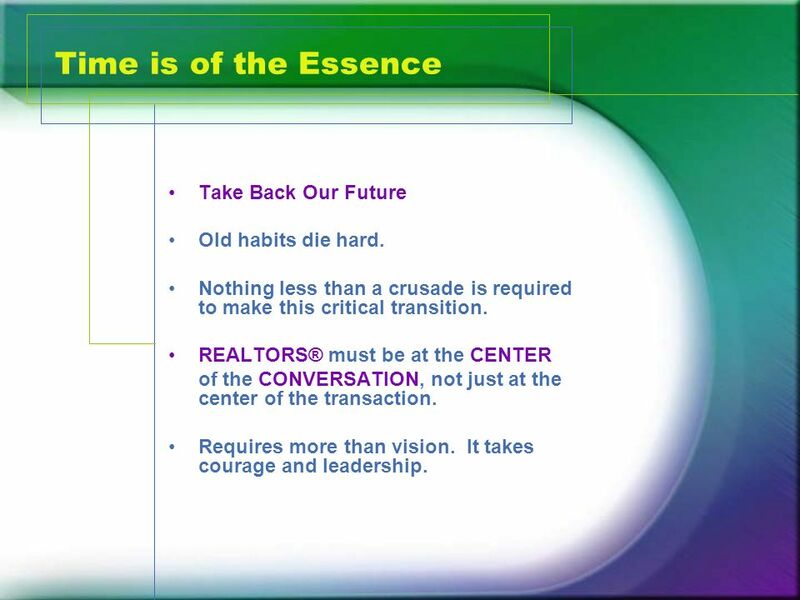 Time is of the Essence The Real Estate Industry has the opportunity to Take Back Its Future. Today, MLS is not the only way to gain exposure for listings. 2 Time is of the Essence The Real Estate Industry has the opportunity to Take Back Its Future. Today, MLS is not the only way to gain exposure for listings. Consumer alternatives are popping up at every turn. MLS of the Future paper is a vision, not a road map. We must draw the map. 4 Vision & Mission Statements VISION STATEMENT MLS 5.0 is the authoritative and trusted source for all things related to real estate, for REALTORS® and Consumers. 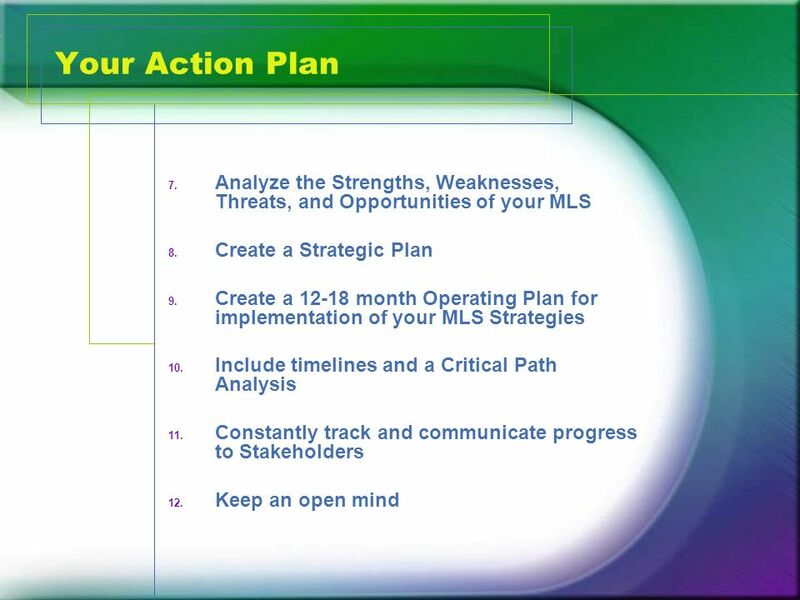 MISSION STATEMENT Keep the REALTOR® in the Center of the real estate Conversation, realizing that the conversation begins far in advance of a purchase and continues after a purchase of real property. Real estate is a lifetime conversation. 8 MLS of the Future FEATURES: Members of the MLS could choose a Rapattoni front end one day and select FNIS front end the next. A user might find that one front end is good for some things and one is good for others, and use the appropriate tool to get the job done. Openness should allow for more applications and solutions and lower prices for REALTORS®. 9 Who Will MLS of the Future Serve? 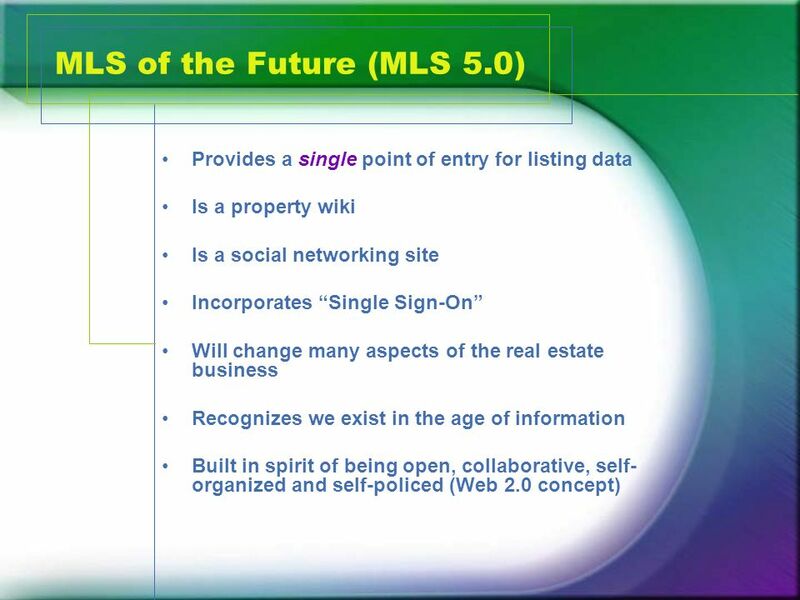 MLS 5.0 will serve the customer of today and position us to be ready to serve the customer of tomorrow. According to NAR, GenX and GenY made up 78% of all first time home buyers. 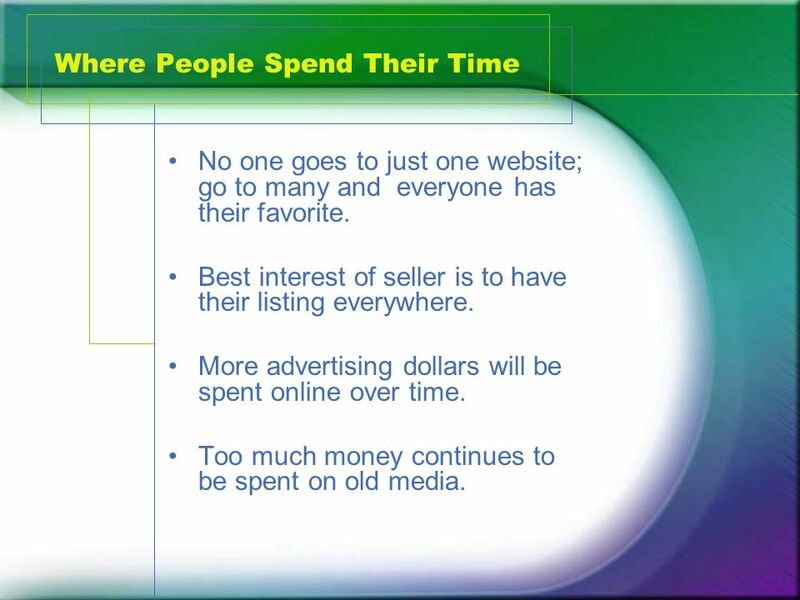 11 Where People Spend Their Time No one goes to just one website; go to many and everyone has their favorite. Best interest of seller is to have their listing everywhere. 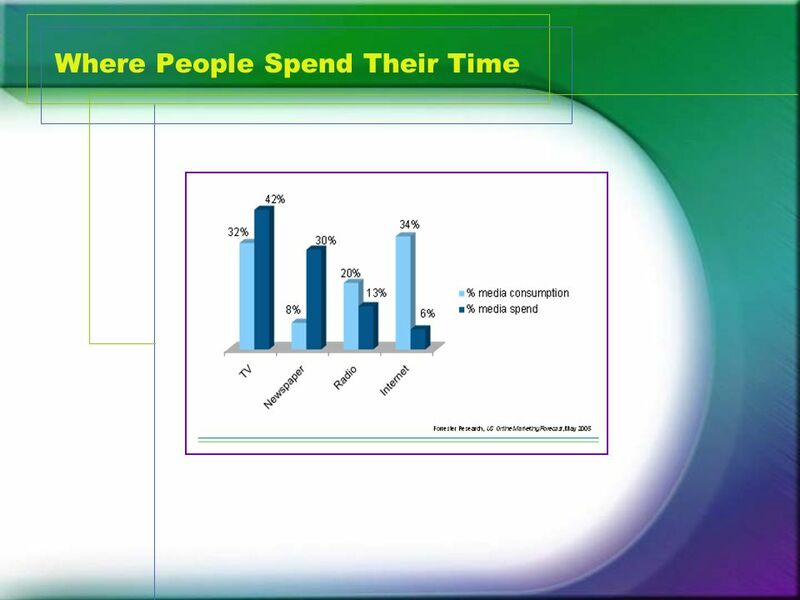 More advertising dollars will be spent online over time. Too much money continues to be spent on old media. 15 Time is of the Essence Take Back Our Future Old habits die hard. Nothing less than a crusade is required to make this critical transition. REALTORS® must be at the CENTER of the CONVERSATION, not just at the center of the transaction. Requires more than vision. It takes courage and leadership. 16 Time is of the Essence Requires bold initiatives. Suspend your skepticism. Step into the Future. Ask: What is the value a real estate professional brings to consumers when information about everything including real estate is so abundant on the web. 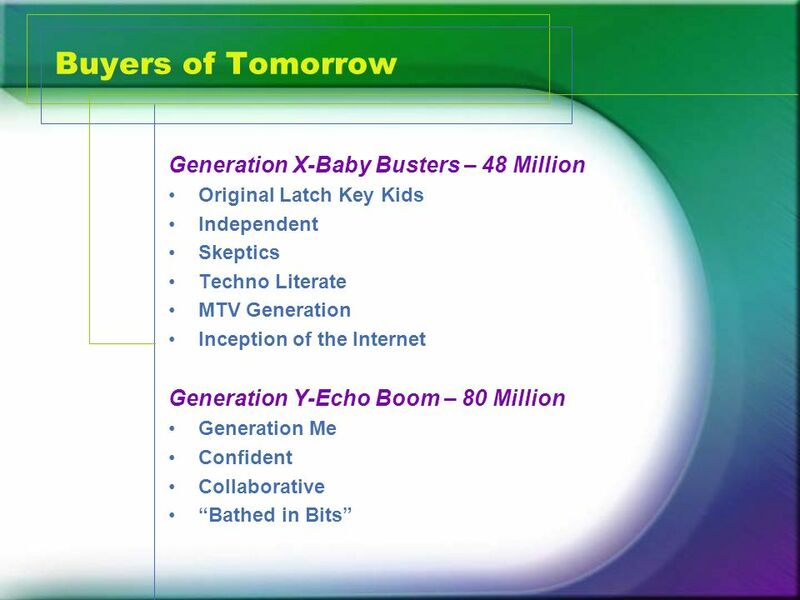 17 MLS of the Future This is a far cry from where the MLS is today, and this is the challenge. 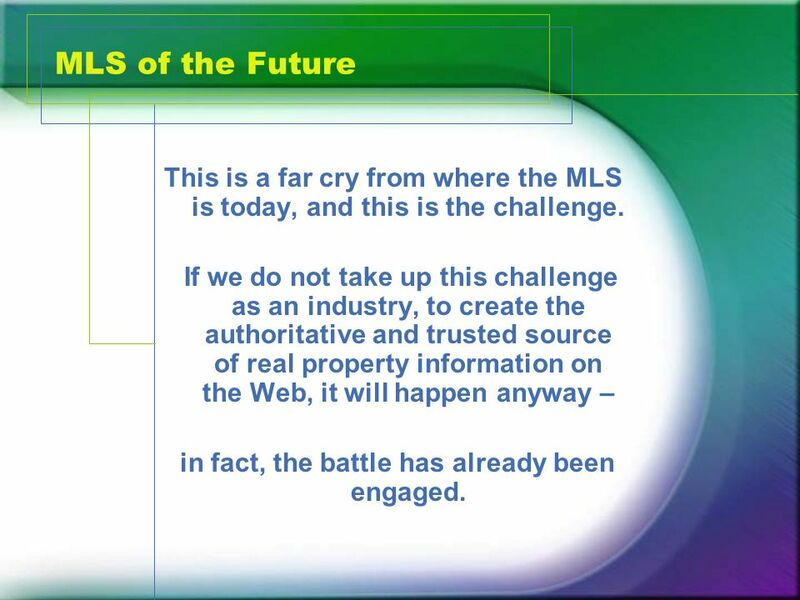 If we do not take up this challenge as an industry, to create the authoritative and trusted source of real property information on the Web, it will happen anyway – in fact, the battle has already been engaged. 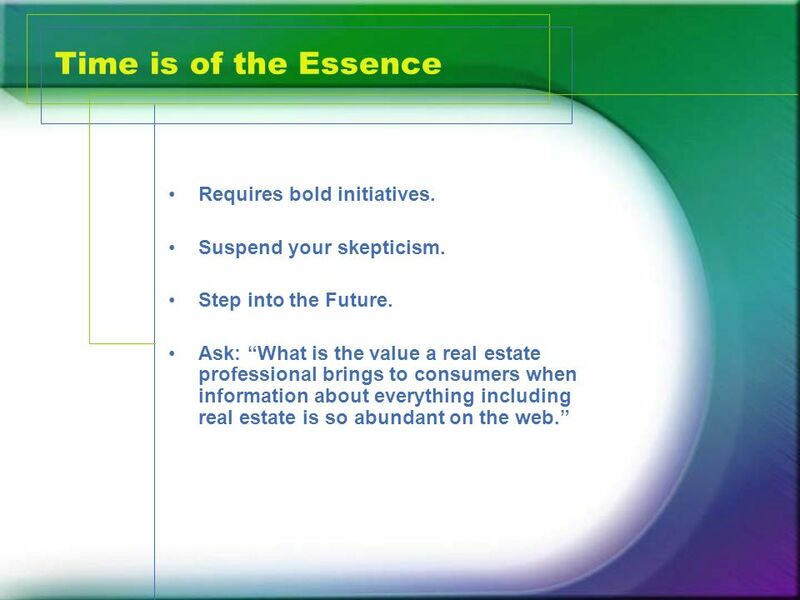 Download ppt "Time is of the Essence The Real Estate Industry has the opportunity to Take Back Its Future. 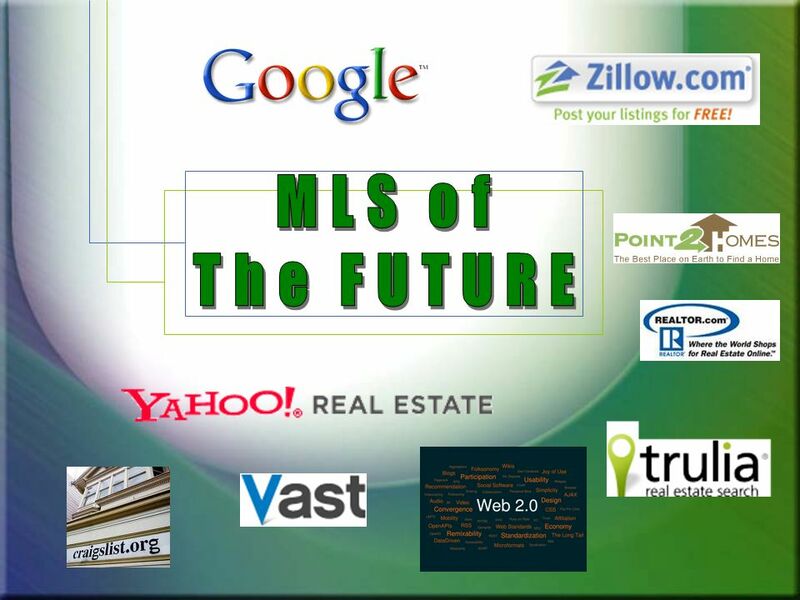 Today, MLS is not the only way to gain exposure for listings." Gracious Living Realty REO & HUD National Sales Program. A Website dedicated entirely to Selling Your Home! Powered by Properties Online, Inc. ©2014. Experience the Future of Real Estate Today Lender-Agent Collaborative Developing Customer Relationships Together. For Investors How it works Investing in private emerging growth companies You are an accredited investor and looking for ways to increase your return. Ross M. Busch Regional Director Northwest AK,WA,OR,ID,MT,WY, NV Cell Official Site of the National Association of REALTOR. 11 A Website dedicated entirely to Selling Your Home! E-Buyer: Understanding Real Estate e-Buyers & How to Market to Them A program by the Real Estate Buyer’s Agent Council, Inc. of the National Association.